A pioneering international study led by Tel Aviv University (TAU) researchers who conducted DNA tests in skeletons placed 6,500 years in a burial cave in Peki’in reveals their origins. According to the research, just published in the prestigious journal Nature Communications, the population of Peki’in in northern Israel was during the prehistoric Chalcolithic (“Copper Age”) Period – 4,500 to 3,900 BCE – a mixture of a local population with a group that arrived from northern Mesopotamia (today’s Turkey and Iran). The cave was discovered in 1995, and the bones of some 600 people were uncovered. But the origin of the population was not known until now and it is considered a major archaeological breakthrough. The research was led by Dr. Hila May and Prof. Israel Hershkovitz of the anatomy and anthropology department of TAU’s Sackler Faculty of Medicine, Hershkovitz also works at the Dan David Center for Human History in the Faculty of Medicine. The study was carried out in cooperation with Dr. Dina Shalem of the Kinneret Institute of Galilean Archaeology and the Israel Antiquities Authority and Dr. David Reich, a leading geneticist at Harvard University Medical School. Peki’in, whose name means “the little valley between mountains,” is believed to have been founded in the year 5,000 BCE. Today, it has a population of fewer than 6,000 people, almost all of them Druze. According to tradition, the Jewish community of Peki’in has maintained a presence there since the Second Temple period. The only time when Jews did not reside there was during the 1936 to 1939 Arab Revolt. Most Jews did not return to the village after the violence, and the only Jewish resident is 87-year-old Margalit Zinati, whose family did return to the village. “The unique burial cave is a natural stalactite cave that was discovered in 1995 when a road was extended in Peki’in in the Upper Galilee,” Shalem noted. Objects such as potsherds of the Chalcolithic period were found in the village, and the burial site was close by, making a 100- dunam (25-acre) settlement a possibility. The bodies were originally buried in graves, with the bones interred in secondary burials in jars and specially decorated clay ossuaries. These were decorated with sculpted images of human faces, including ears, eyes, beard, and sometimes hands and breasts. The period’s impressive metal artifacts, which reflect the first known use of the “lost wax” technique for casting of copper, attest to the extraordinary technical skill of the people of this period, they wrote. The cave, around 17 meters long and 4.5 to 8 meters wide, was sealed by natural processes during or around the end of the Late Chalcolithic period (around 3900 BCE). 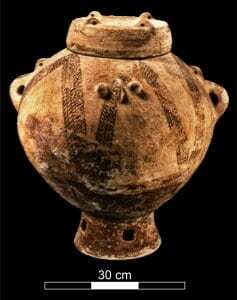 Archaeological excavations have revealed an extraordinary array of finely crafted objects, including chalices, bowls, and churns, as well as more than 200 ossuaries and domestic jars repurposed as ossuaries (the largest number ever found in a single cave), often decorated with anthropomorphic designs. During the two decades since the discovery, researchers have wondered whether the population that buried its dead in the cave migrated to another part of the region and brought with it new cultural elements or whether they were a local population that adopted ideas from neighboring cultures through trade relations. 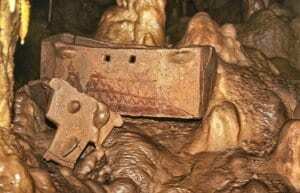 Fortunately for the researchers, DNA sequences were preserved, albeit partially, in the bones of 22 individuals in the cave – a larger number than a single site in terms of genetic research of prehistoric populations. May further noted that “no genetic continuity was found between the population of Peki’in and the Chalcolithic population of later populations.” This indicates another demographic change in the region that led to the disappearance of the Chalcolithic culture.